Synopsis: A veteran assigned to extract Earth’s remaining resources begins to question what he knows about his mission and himself. The year is 2077, and mankind has fled the earth following a catastrophic war with aliens known as Scavs. Earth won the war with these aliens, but those who survived the war and the natural disasters that arose when the Scavs destroyed the moon in their quest for resources, have been relocated to Titan, one of Saturn’s moons or, if more privileged, to a gigantic spaceship known as the Tet which orbits the deserted earth. Meanwhile, the automated operation to extract Earth’s dwindling reserves of water from its seas is protected by drones from sabotage by the remaining scattered bands of Scavs. Overseeing this automated operation is Jack Harper (Tom Cruise), whose job is to repair drones that are damaged in skirmishes with the Scavs. Jack lives in an opulent floating penthouse high above the earth with Vika (Andrea Riseborough), who not only covers his back from a control centre in the penthouse when he’s out on patrol, but also warms his bed at night. Nice. But Jack keeps having these dreams in which he clearly shares some mutual affection with a woman who isn’t Vika. And these dreams feel more like memories than dreams, even though both Jack and Vika had their memories wiped at the start of their mission so that they wouldn’t give away any sensitive secrets if captured by the Scavs. And there are other clues that all isn’t quite as it should be in the world of Jack Harper. He shows a curiosity for artefacts from the old world which should have been wiped along with his memory and, when he gets a few moments to himself, likes to visit a secluded tranquil glade complete with greenery, lake and wildlife where he plays scratchy vinyl records of Led Zep and Procol Harum. 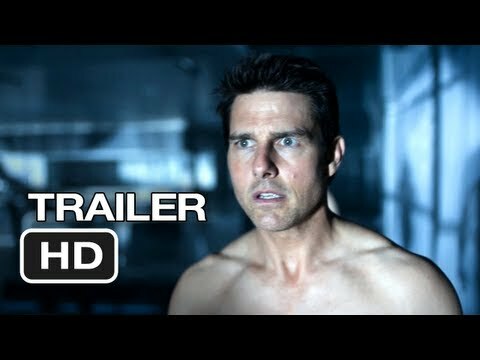 Oblivion can be defined as the state of being unconscious and unaware of what is happening around one, which pretty much sums up Jack’s situation when we meet him. To reveal much more would require the disclosure of major plot points, but it’s probably fair to say that many viewers will figure out what is going on long before Jack figures it out. But then, Jack is something of a pedestrian character, thanks partly to a deliberately toned down performance from Cruise. Fair enough, a man with only a year or two’s memory is still something of a blank slate, particularly as all that we are is largely defined by all that we’ve experienced, so it’s perhaps understandable that Jack is something of a bland character to say the least. But whether that’s intentional is open to question: sometimes adhering to the realism of a scenario can be the kiss of death for a movie. 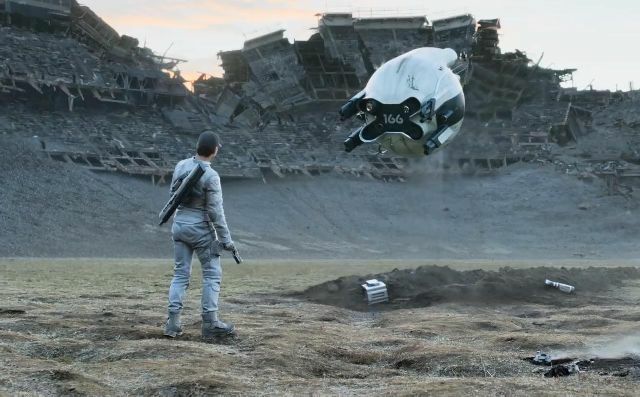 The post-apocalyptic world created by director Joseph Kosinski is a coldly beautiful one, despite emerging from a nuclear Armageddon that took place comparatively recently. The old world — our world — is largely buried beneath largely featureless plains of grey sand, with just the peaks of bridges and skyscrapers still visible. There’s a reason for this, and you’d think that Jack might question just how the world became buried so quickly but, as I said earlier, he’s a bit of a plodder is our Jack. He needs women falling out of the sky to start him questioning both his existence and his function and purpose. And if he hadn’t been kidnapped by a renegade called Beech (Morgan Freeman) he would probably have continued with his life with only the occasionally furrowed brow. Kosinski, who directed the poorly received TRON: Legacy, and on whose graphic novel this movie is based, clearly spent a lot of time on the look of the planet, and the movie’s visuals are breath-taking at times. But that’s scant consolation for a storyline that never really comes close to engaging an audience either emotionally or intellectually.